thoroughly cleaning back, breast and flanks. 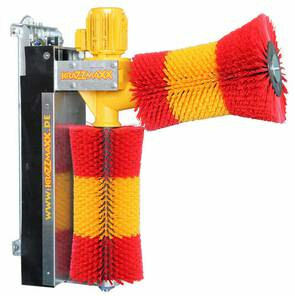 We stock three ranges of cow brush; Happy Cow and KrazzMaxx automatic brushes, and fixed, non-powered brushes. 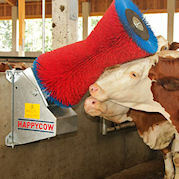 Happy Cow have three different brush options; a vertical swing brush, a wall mounted angled brush and a two-brush machine with horizontal and vertical brushes. 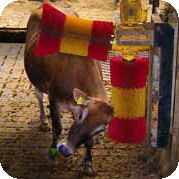 Buy Happy Cow and simple fixed brushes from our online shop with free delivery to the UK mainland. 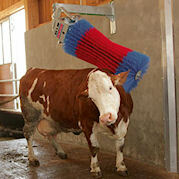 This is a deluxe, heavier duty cow brush suitable for both indoor and outdoor use. 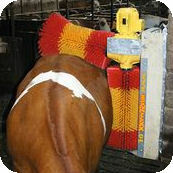 See a video of the cow brush in action.